As a customer experience designer in a bank, I’m dealing with complex banking documents every day. These are investment product communications such as sales tools, brochures and fact sheets. Most of them indeed need major surgery in content and design to be understood by customers and help customers make a confident decision. 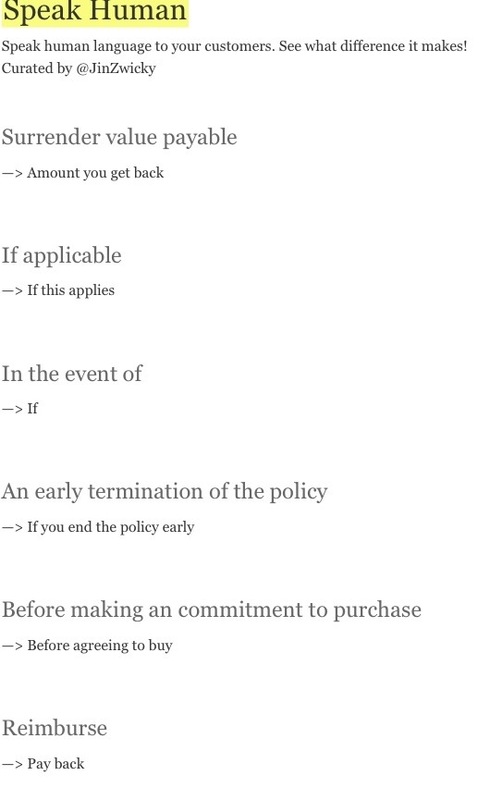 I’ve been tweeting some brilliant examples of how complex financial services language can be ridiculously simple! Owing to TheBankChannel‘s push, I created a tumblr blog Speak Human that will continue to grow as I tackle more speak-bank challenges. Speak human. See what difference it makes to your customer experience! November 27, 2011 in on Simplicity.